The European Policy Center in cooperation with the Balkans in Europe Policy Advisory Group organized the policy event “Assessing the EU’s rule book for the rule of law” on January 15, where the BiEPAG’s policy study “Strengthening the Rule of Law in the Western Balkans: Call for a Revolution against Particularism” authored by the BiEPAG Members, Tena Prelec, Jovana Marovic and Marko Kmezic. The authors of the policy study were joined in the policy dialogue by Srdjan Cvijic, Senior Policy Analyst on EU external relations, Open Society European Policy Institute and Sabine Zwaenepoel, Senior Expert Coordinator, Centre of thematic expertise on Rule of Law and Fundamental Rights, DG NEAR, European Commission. Corina Stratulat, Senior Policy Analyst at the European Policy Centre was chairing the event. In the first part, Sabine Zwaenepoel from the European Commission pointed out that the accession process has become more comprehensive, but that it is fair and it is in the hand of aspiring countries. – Dual sanctioning and rewarding mechanism are needed. Not even countries members of the EU are off the “hook” from reviews. How fast countries will become EU members is up to them, some will be faster than others – said Zwaenepoel. 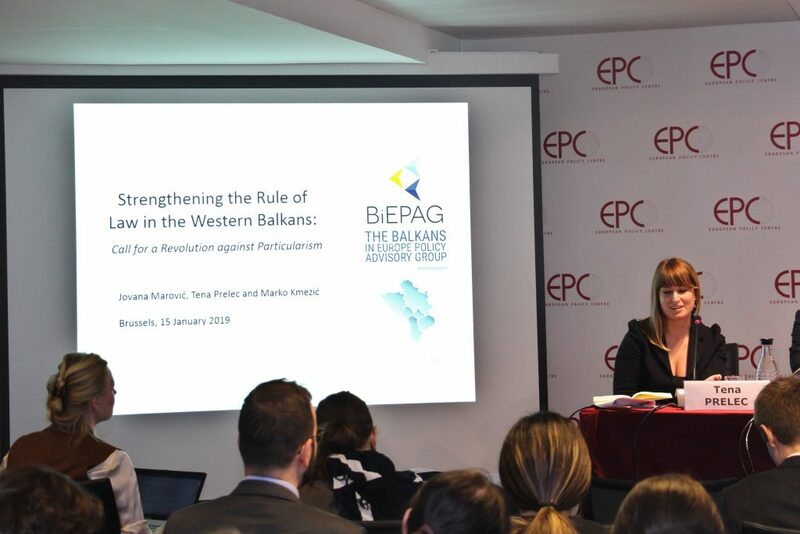 In presenting the policy study, BiEPAG Member Tena Prelec confirmed that sometimes issues go beyond the possibilities of the instruments we have, while presenting the case against particularism in the Balkans, when problems become the rules. – The changes happen slowly, because the rules of the game are skewed. Action plans are outdated, benchmarks should be more concrete, peer reviews should be transparent and reporting should be bolder – said Prelec. -We need more actors from the civil society, independent media, grassroots, local initiatives. All these actors needs to be socialized in order to reach the point where the rule of law in the Western Balkans is sustainable. Srdjan Cvijic, Senior Policy Analyst at Open Society Foundations and BiEPAG Member was the last speaker to contribute to the debate presenting the example of the judicial reforms in Serbia through the publication When the Law Doesn’t Rule by Open Society European Policy Institute, Transparency Serbia, and the Centre for Investigative Journalism of Serbia.